Facebook has launched an integrated advertising campaign with Wieden & Kennedy Amsterdam aimed at championing Britain's small businesses. The campaign, which will run for eight weeks, features 16 businesses sourced from popular Facebook pages and some of the platform's small business-focused initiatives. According to Facebook, the campaign is part of its programme of investment into UK SMBs which has already provided 10,000 women with training. This investment is strategic for Facebook from several perspectives. It gets more small businesses using Facebook, potentially scaling up to become B2B customers for its advertising and data services. The programme also provides the platform with good PR as corporate sustainability initiative, with Facebook supporting the communities that rely on it. 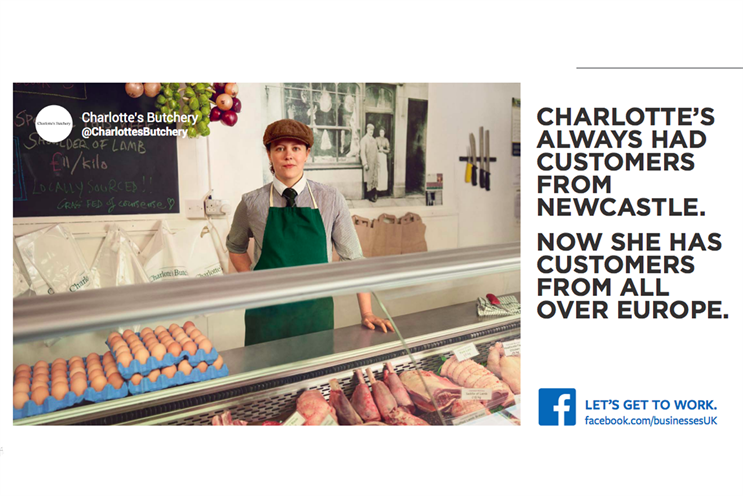 The businesses featured in the Campaign include the Repton Boxing Club – the UK's oldest boxing club; Huit Denim - a premium jeans brand from Cardigan, Wales; and Charlotte's Butchery, an independent butcher shop run by Charlotte Mitchell. Facebook UK Let's Get To Work from Wieden+Kennedy Amsterdam on Vimeo. Each business featured on the campaign will be profiled on a dedicated microsite that explains how they have used Facebook to build a community or scale their business. "More than one in three small businesses in the UK are using Facebook to build their business," Ciaran Quilty, vice-president of SMB Facebook EMEA, said. "This new ad campaign celebrates those businesses, showcasing the vibrancy of British entrepreneurs who are making a great impact in the UK and across the globe." The campaign will run across outdoor, TV, print, online and cinema and will tell the stories of fascinating and successful small businesses from across the UK. "This campaign celebrates the hard work and dedication behind all the small businesses out there. It was important to us to feature real businesses and tap into the unique and interesting stories behind each of them. The UK is full of people turning their passions and ideas into a business during uncertain times. Facebook can't do all the things they do, but Facebook can help show the world what they do," Wieden & Kennedy Amsterdam creative directors, Daniel Schaefer and Szymon Rose, said in a joint statement. Linked to the campaign, Facebook launched Community Boost last week, a programme aimed at training one million people and businesses in digital skills by 2020, in Europe. As part of this, Facebook will give 50,000 people in the UK the digital skills they need to find work or get online over the next two years. This new programme will offer training in digital skills, media literacy and online safety to underrepresented groups, and will be offered in addition to opportunities already offered through existing programmes such as #SheMeansBusiness. Facebook has partnered with Freeformers for this and the programme will reach 12,500 people in Britain through in-person training and 37,500 online. Are Facebook's news feed changes bad news for brands?